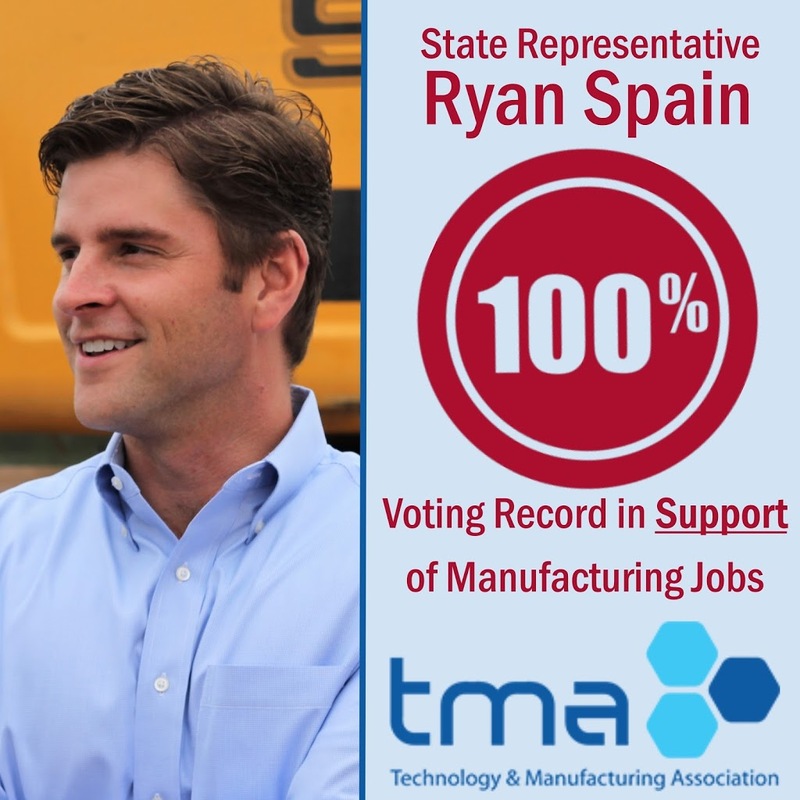 In their annual rating of legislative voting records for the Illinois House and Senate, the Technology and Manufacturing Association (TMA) rated State Representative Ryan Spain with their highest rating available for a voting record in strong support of manufacturing jobs in Illinois. “I am proud to support manufacturing in Illinois and the jobs this industry brings to our residents,” said Rep. Ryan Spain in reaction to TMA’s rating. Not only did Rep. Ryan Spain score a 100% voting record on manufacturing issues, as rated by TMA, but he also was one of only 10 members of the Illinois House to achieve a 100% rating. TMA’s public policy agenda scores legislators on taxation policy, regulation policy, and education and career readiness issues. According to TMA, a leading manufacturing trade association in Illinois, support for manufacturing interests in the Illinois General Assembly has nose-dived over the past two years. In 2015, 42% of Illinois state representatives had a cumulative score of 75 or better, meaning they were pro-manufacturing. Two years later, in 2017, only 23% scored 75 or better, meaning a stunning 77% vote against bills that would encourage manufacturing in Illinois. Illinois’ bad public policies have led to an unprecedented population loss as more residents move out of state to find employment in the far-more jobs friendly climates across our state borders. Those moving out of state include members of a critically-needed trained workforce that will be badly needed in the years ahead. A full copy of the legislative scorecard is available at: http://www.tmaillinois.org. Founded in 1925, the Technology & Manufacturing Association represents and supports manufacturers in Illinois, Indiana, and Wisconsin with their mission to help members achieve profitable growth and business success.